The colourful adult plumage of this bird is acquired at about 2-3 years of age, or the second complete moult. A.e. erythropterus: Male-body colour bright green, with blue tint on hindcrown and occiput; black mantle, upper back and scapulars; deep blue on lower back, turning to paler blue on rump; bright red lesser, median and inner secondary wing coverts; black outer secondary coverts tipped with green; green tail tipped with yellow. Bill orange/red tipped with paler orange/red. Eye orange/red. 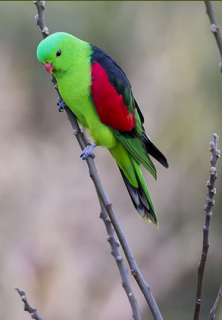 Female-plumage duller: body green; green mantle, upper back and scapulars; blue lower back and rump; red outer, median and inner secondary wing coverts; black outer secondary coverts tipped with green; side tail feathers margined with red/pink on inner webs. Bill dull orange tipped with brown. Eye brown/orange. A.e. coccineopterus: Male-differs from erythropterus in that there is stronger suffusion of blue on hindcrown and occiput; slightly paler red of upper wing coverts; slightly smaller in size. Female-as in erythropterus, but dull green of wings and upper back more yellow. Slightly smaller in size. A.e. erythropterus: As in adult female, but in males black bases to secondaries form band at bottom edge of upper wing coverts, and yellow/green margins to secondary coverts give scalloped appearance. Bill orange/yellow. Eye pale brown. Calls given in flight or soon after landing are sharp notes; when alarmed a repetitious, harsh chikking noise. While feeding emits soft, melodious chattering. Small seed mix such as: canary, oats, safflower and a little hemp; spray millet; limited sunflower seed, dry, soaked or sprouted; sprouted beans such as mung, cooked butterbeans and lentils; boiled maize; green leaves such as: Swiss chard, lettuce, sowthistle, dandelion, chickweed; vegetables such as: carrot, corn, celery, zucchini or other squash, green beans and peas in the pod; fruit such as: apple, orange, banana, pomegranate; nuts such as: hazelnuts (lightly cracked), pecans, and roasted peanuts; complete pellet. Provide as big an aviary as possible, with many perches and fresh branches for chewing; provide water bowls for bathing. This species is acrobatic so also supply swings, different sized perches and ladders for climbing. Nest log or deep vertical box with inside diameter of 11-12" (28-30.5cm). Population is thought to be undergoing a decline due to habitat destruction. A.e. erythropterus: NE Australia from inland N New South Wales and NE South Australia north through Queensland to Cape York Peninsula and Gulf of Carpentaria. A.e. coccineopterus: N Australia, along with larger offshore islands, from Kimberley division of W Australia east to NW Queensland; also S New Guinea, from mouth of Digul River, SE Irian Jaya to mouth of Fly River, SE Papua New Guinea. Found up to 600m (1968 ft) in subtropical and semi-arid Eucalypt and casuarina woodland, forest edge, riverine woodland, Acacia scrub, mangrove, farmland, cypress pine, Callitris sp. scrub and lowland savanna. Feeds on seeds, fruit, flowers, and insects; in mangroves mistletoe is preferred. Is nomadic at edges of range, but considered to be resident elsewhere. Is usually seen in small groups of up to 15 individuals; the largest groups seen at the end of the breeding season when families gather at feeding areas. Conspicuous and common. 3-6 rounded eggs, 31.0 x 26.0mm (1.2 x 1 in). April or May in the north; further south August-February.